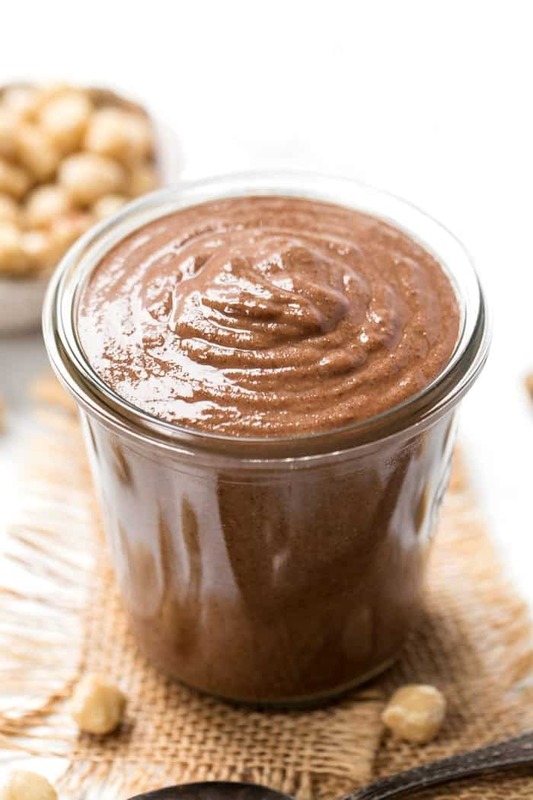 This superfood Vegan Nutella recipe combines hazelnuts with amazing superfoods to get a healthy, delicious and decadent twist on this classic junk food! But classic Nutella? Not plant-based and definitely not healthy. So today we're making it from scratch! 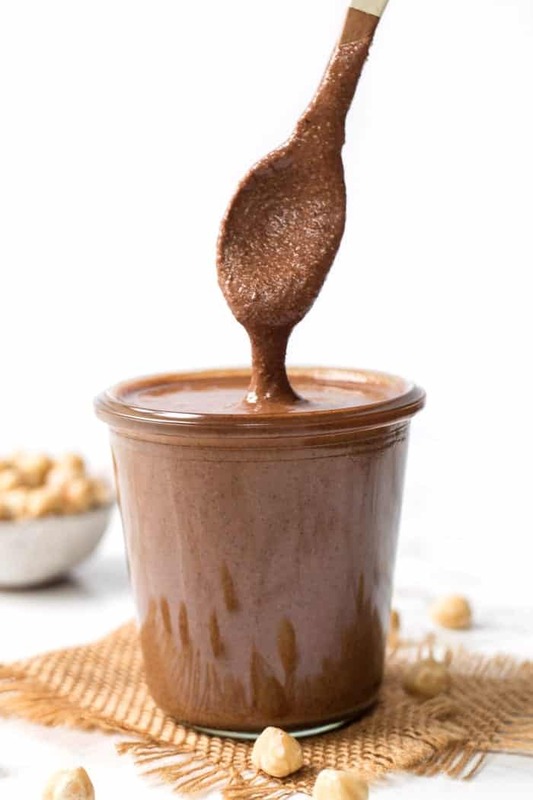 We're stripping out the junk, and adding in some of my favorite superfoods, to create this epic Superfood Vegan Nutella. When I was in high school, I did a foreign exchange program in a small city outside of Venice, Italy. I stayed with an Italian family for about 10 days, and every single morning we were served Nutella with our breakfast spread. Back then (almost 12 years ago now), this was something new. Not only the fact that breakfast was an assortment of cereals, toasts, pastries, etc., but Nutella. I was the kid growing up who had to check the label on cereal boxes because we weren't allowed to have anything with more than 10g of sugar in our house (which I know seriously thank my parents for). So chocolate for breakfast? I was ALL in. But now that I'm more conscious and aware of the food I put into my body, I realize that chocolatey spread of my dreams is actually not so great. Packed with sugar, palm oil, milk powder and chemicals that are just so not needed! Luckily, making Nutella at home is crazy simple. 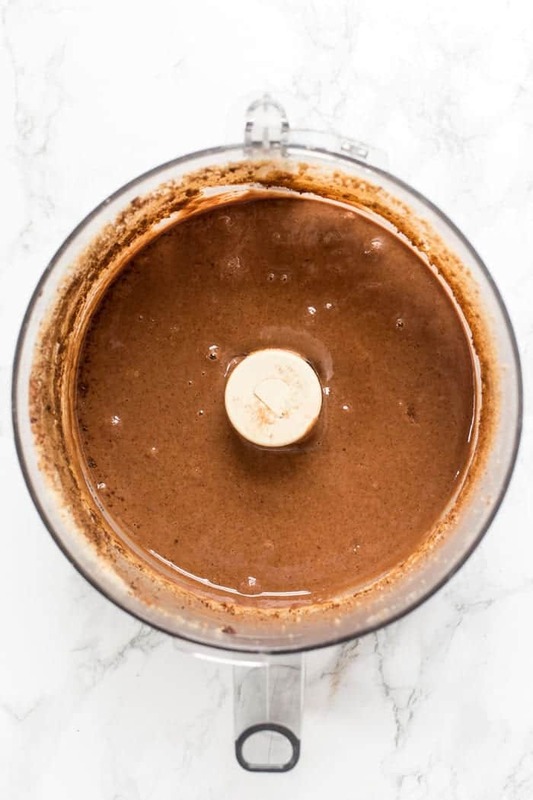 I've given you a 2-ingredient Nutella recipe before, but today we're changing things up and we're making this recipe free from refined sugar, and also sprinkling in some superfoods to make it that much better for you! Our starting point is blanched hazelnuts. I like to toast mine before processing them in the food processor because I've found that giving them a little heat not only makes the blending process easier, but it also give the nutella a really nice flavor. Just remember, making homemade nut butters takes TIME. And lots of it. Be patient, this could take upwards of 15 minutes to get smooth. But once you do have it nice and smooth, then it's time to add your goodies. Our secrets for our superfood Nutella? Raw cacao, MCT oil and medicinal mushrooms! Now before you click the back button because mushrooms don't belong in your nut butter, bear with me. I promise these little powders are incredible and totally untraceable to the palette. You'll get all the amazing benefits without even knowing they're there! 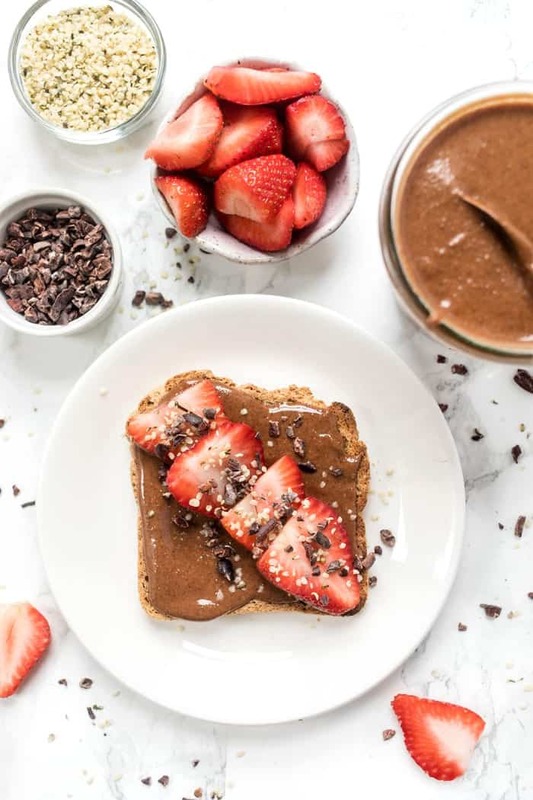 Here's what we're using to make our Vegan Nutella superfood-rich! Raw Cacao. Incredibly high in antioxidants, it's a great little energy booster (hello, morning blues! ), it strengthens skin, hair and nails, and it can help to improve cognitive function. MCT Oil. A medium-chain triglyceride oil that has been shown to be much easier to digest. When consumed, it goes directly to the liver and brain instead of being stored as fat which means it can boost our metabolism and actually reduce stored body fat. MCT oil is also great for gut health, have antioxidants AND are anti-inflammatory. Reishi. This is known as the “queen” of mushrooms and is a powerful immune modulator, cardiotonic, hormone balancer, and nervine tonic. It's amazing for harmonizing the mind and body, and has been used for thousands of years to help prevent aging, reduce inflammation, help with digestive issues, relieve anxiety and insomnia. Chaga. This is known as the “king” of mushrooms and just like reishi has a very broad range of uses. Chaga is one of the highest known sources of antioxidants but is also rich in phytonutrients, zinc, b-vitamins and digestive enzymes. Chaga can also reduce inflammation, cleanse the liver, aid in digestion, and regulate the immune system. And yes, we're adding ALL these bad boys into our vegan Nutella (along with some coconut sugar to sweeten it up a bit). For starters, think of this as any other nut butter just with a hint of chocolate. 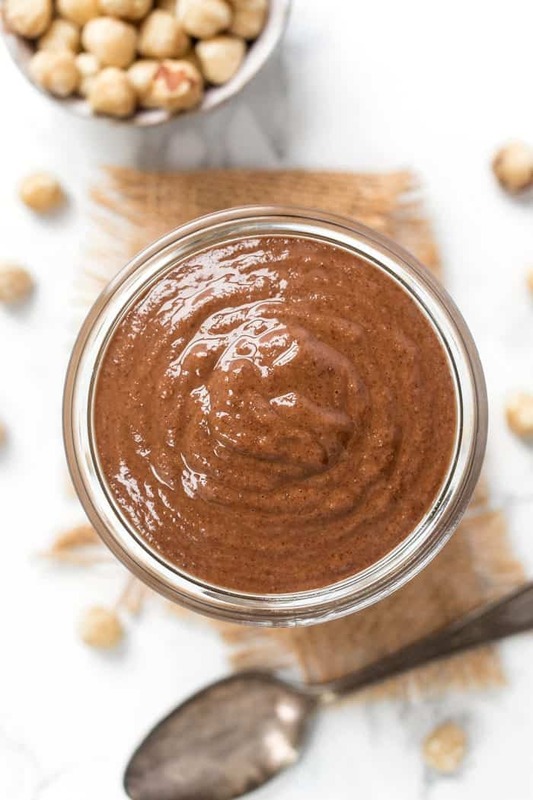 Wherever you might use almond butter, peanut butter or cashew butter, this Nutella would be perfect. You can also think of it as a chocolate sauce. Since it's nice and drippy, you can drizzle it on all sorts of things! 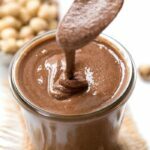 No matter which way you try this Superfood Vegan Nutella, I know you are going to fall in ♡ with it! 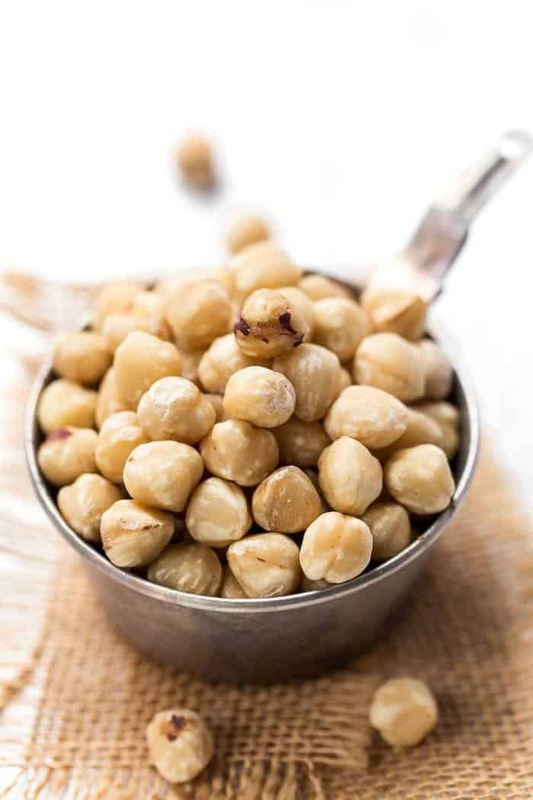 Add the hazelnuts to a toaster oven baking sheet. Toast for 5 minutes, until nuts are golden brown. No toaster oven? Roast at 375º for 10 minutes, stirring every 3 minutes. 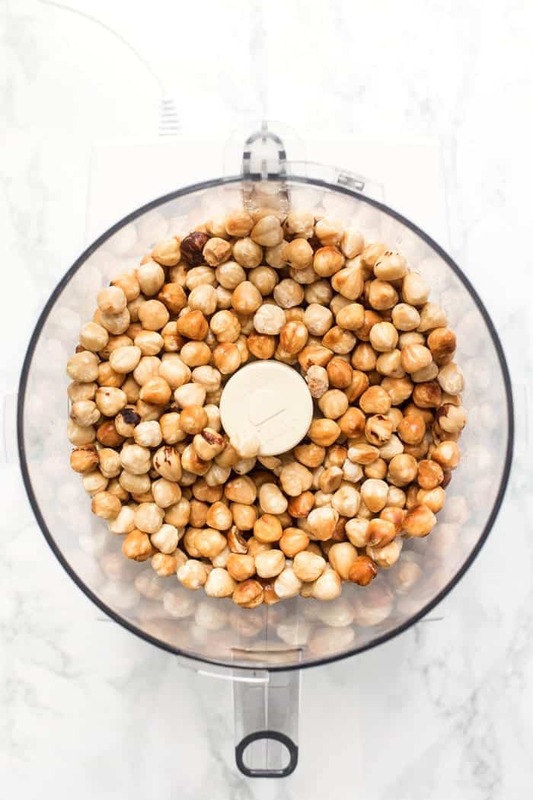 Once browned, transfer the hazelnuts into a food processor. Process on high until the nuts resemble and smooth butter, scraping down the sides as needed. This process can take a while, so be patient! Once smooth, add the remaining ingredients into the food processor and blend to combine. Taste and add additional sweetener if desired. Transfer the nutella into a glass container and allow to cool fully before sealing and storing in a cool dark place. * if you want to try these mushroom powders, head over to www.rootandbones.com and use code "simplyquinoa" for 15% off! Do I have to put in the mushroom powders? Will it affect the taste? And is there a subatitute that I can use for coconut oil? Looks wonderful cant wait to try. I have two questions, one, can one use unblanched hazel nuts? Two can one soak the hazel nuts for couple of ours before blending? (Will this also not then not remove the skins)? Thank you! Yes to #1, but for #2, the nuts need to be completely dry before you blend them. I wouldn’t recommend soaking unless you have a dehydrator to dry them out before blending! I made this and I’m in love!!! I have one question though! For the nutrition facts, is 1 serving 2 tablespoons?? Thank you!!! Love your recipes!! Une portion de combien 15 ml? 30 ml? Haha thanks! It was frustrating when I was a kid, but I’m SO happy about it now 🙂 definitely something I’ll be incorporating into my parenting lifestyle! It sounds interesting! I have made healthy Nutella before (I used minced dates as the sweetener) but I never tried it with reishi. I hope you (and he!) enjoy it!! PORQUE ES NECESARIO PONER “POLVOS DE HONGOS” ?? Looks lovely! 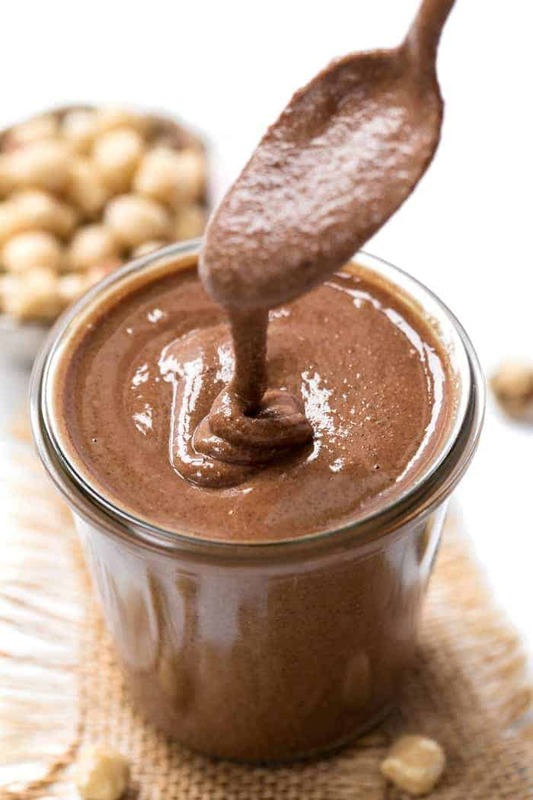 I’d want to add maca powder, cinnamon, or even activated charcoal into my superfood nutella! The charcoal sounds weird but I think it’d look kind of cool!